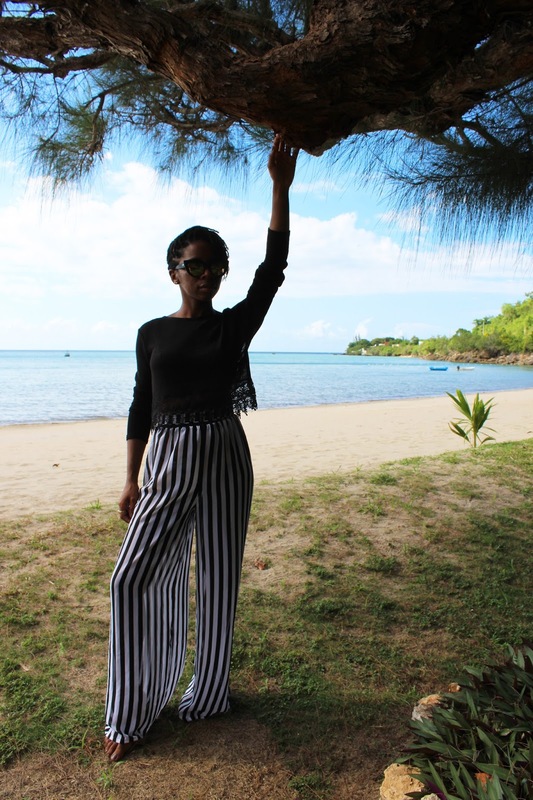 You probably didn't give it much thought but ladies, this summer, you NEED a stripe cover-up pants for the beach! So cover ups! Generally speaking a cute shorts and a tank top was pretty much do it for me. Once I wore a maxi tank with high side slits over my bikini that I had bought from F21 and I really felt like I was Paris Hilton on that day. These stripe pants though, they really changed the game. As soon as I put them on I knew I could no longer go back to my old ways. I was IN LOVE! They are locally made by a Jamaican designer MiSimBeachBabe . A part from the fact that I feel ten feet tall in them (petite ladies who need heels when you can wear stripes! ), the print is so CLASSIC so whether its 2005 or 2050 they would still be considered super chic! If they weren't so sheer I would honestly wear them out on a casual day. So breezy, so easy; so me. For this look I paired the cover-up pants with a sheer knitted H&M crop top with macrame lace details. I'm also wearing a Quay Australia Kitty Mirror Sunnies for a little added flair. I have never worn pants a s a cover up I usually just wear a little dress or sarong but your pants are so chic so I most definitely would give them a try.